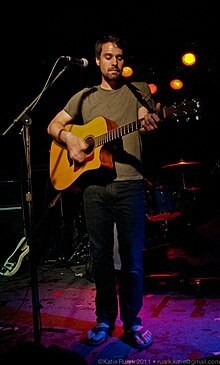 Jonathan Jacob Walker is an American musician, singer, and songwriter. Formerly the bassist of Panic! at the Disco, Walker was also the lead guitarist and occasional split vocalist of The Young Veins (which he founded with former Panic! lead guitarist Ryan Ross), now on indefinite hiatus. Having went on to release several solo recordings, he is now mostly songwriting and producing. Jon Walker at the Beat Kitchen, Chicago, 5/21/2011. Walker attended Bartlett High School in Bartlett, Illinois and first became known in the Chicago scene in 2003 when he was just 17 years old  as the replacement bass player for 504Plan. The band broke up soon after he joined, and Walker then toured with The Academy Is... as a guitar tech and a videographer. Walker joined Panic! at the Disco in May 2006, replacing former bassist Brent Wilson. At the time he joined, he was 20 years old, making him the oldest band member. Walker was with Panic! at the Disco when they won the video of the year award at the 2006 MTV Video Music Awards for their song "I Write Sins Not Tragedies", although he had not recorded the song with the band nor did he appear in the video. He co-wrote and released one studio album with the band, Pretty. Odd., and one live album, ...Live in Chicago. In July 2009, he and fellow band member Ryan Ross left Panic! at the Disco, citing creative differences, and formed another band, The Young Veins. The Young Veins completed two tours in 2010, one with Foxy Shazam and one with Rooney. On December 10, 2010, Walker announced via Twitter that The Young Veins would be on hiatus, later noting in interviews that the creative and personal differences of the past carried over to the new project. Since 2011, he has self-released 2 full length and 3 ep solo albums, all of which are currently available for free download from his official Bandcamp page. He has also released a song with Victoria Asher, formerly of Cobra Starship, titled "When Push Comes to Shove" on December 15, 2016. On July 24, 2018, the short film "Intermission" was released, in which Walker composed the original score. March 2008 – Pretty. Odd. June 2010 – Take a Vacation! ^ a b Deming, Mark. "Take a Vacation! - The Young Veins | Songs, Reviews, Credits". AllMusic. Retrieved December 28, 2016. ^ Panic at the Disco – Page 1 – Music – Dallas. Dallas Observer (April 17, 2008). Retrieved on 2011-02-01. ^ "Young Veins, Take A Vacation". Tuned Up. ^ "Panic! at the Disco are back with dark pop punk at HMV". Tamworth Herald. 18 March 2011. Retrieved 7 May 2016. ^ "504 Plan biography". Artistwiki.com. 2006-10-23. Retrieved 2011-09-15. ^ Who are Panic! at the Disco?, BBC News, September 1, 2006. ^ Panic Embraces '70s On New Disc, Tampa Tribune, April 18, 2008. ^ a b A sudden Panic! has hit the world, Seattle Post-Intelligencer, December 1, 2006. ^ Former Panic! At The Disco Members Become The Young Veins, MTV, July 28, 2009. ^ Ex-Panic! At the Disco Members Will Embrace Beach Boys, Kinks, Rolling Stone, July 14, 2009. ^ Twitter announcement, Jon Walker, 2010-12-10. ^ Keltie Colleen (2011-06-27). "Jon Walker Explains Leaving Panic! At The Disco and New Solo Songs". Keltiecolleen.buzznet.com. Retrieved 2011-09-15. ^ (VickyT), Vicky-T. "Vicky-T - Push Comes To Shove Ft. Jon Walker [Official Music Video]". YouTube. Retrieved 1 January 2017. ^ "Hear ex-Panic! At The Disco bassist's wistful new solo song". Alternative Press. 2018-12-20. Retrieved 2018-12-21.